Yesterday, Memory Makers Magazine issued a public statement on their message board confirming their plans to shut down after the Sept/Oct. 2009 issue. The statement, issued in the name of F+W Media Crafts/Genealogy & Special Sales Vice President Teri Mollison, indicates that the company is canceling the Memory Makers Masters contest as part of the magazine's shutdown. The passion and dedication of the Memory Makers contributors, advertisers, vendors, staff, and readers these past 13 years is what has made this business so rewarding for those of us fortunate enough to publish the magazine. Sadly, in light of increased industry consolidation, severe advertising cut backs, poor economic conditions, and lack of new consumers coming to the hobby, we cannot continue to profitably publish the magazine on- or offline. As we work to bring this last issue to closure, however, I want to take a moment and thank you for your role in crafting the Memory Makers story. The beautiful thing about this magazine is that it has memorialized the scrapbookers and scrapbooking companies forever that really launched this exciting hobby. We are proud and thankful for that heritage. The company's Memory Makers Magazine website will continue in operation, as will the Memory Makers Books publishing imprint and their Great American Scrapbook Conventions. The Scrap Review staff is so sad to hear this news. Memory Makers was the first magazine to feature a layout of mine on their cover and it was one of the most thrilling things that has happened to me. Truly, this is an interesting time for the scrapbook industry. In the coming year it seems that all we can do, as scrappers, is watch and wait. It's no secret that in a failing economy non-essentials are the first to go. But we participate in a hobby that, to many of us, is so much more than a hobby. And that makes the continuous decline of scrapping magazines, failed LSS's and struggling manufacturers a sad, and sometimes heartbreaking, slide. 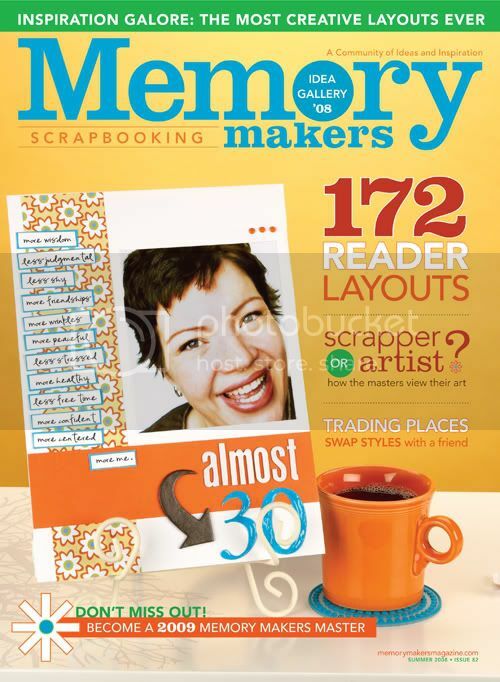 The Scrap Review wants to thank all involved with Memory Makers magazine for their hard work, dedication and passion. I, too, loved this magazine. The talent that was shown in every issue was always something to look forward to. Best of luck to all those involved. sad to hear this news - the industry is going through some major change, but everyone is right now :-( thanks for sharing your lovely cover!! Emilie ~ I have followed your blog for awhile and been so happy every time I saw one of your layouts published in the various magazines. But I gave out a "whoo hoo!" when I first saw the above cover. I was SO happy for you! It's a shame that Memory Makers and other scrapping magazines have fallen on hard times. I personally prefer the printed editions of magazines so that I can have them handy to look at whenever I want to, especially at night when I go to bed and want something to read - beats sitting in front of a computer squinting at the screen to see something. But like any business, it will adapt and change and get stronger - I don't think scrapping is going away anytime soon! That's sad to hear. Always enjoyed their magazine. This is a shame considering that I just renewed my subscription.